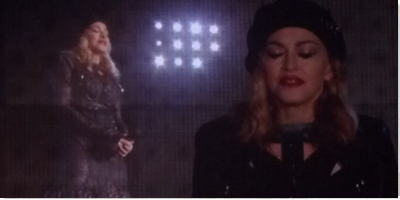 One of the many, many highlights of Madonna's epic 2012 MDNA Tour concert was the stunning ballad "Masterpiece". The Golden Globe winning song must surely rank up there with the best ballads of Madonna's entire career and the live MDNA Tour performance was for many fans the most emotional point in her 2012 concerts. The very last time this song was performed on the tour came on Wednesday December 19th in the beautiful Chilean capital Santiago. It was wet and cold that evening and Madonna was ill - but another stunning performance was delivered.